Randy Newman saw it, “Oh Baltimore, Man it’s hard, just to live, just to live.” His myopic vision of a city he had only ridden through on a train, when he wrote the song, Baltimore, has proven to be 20/20. 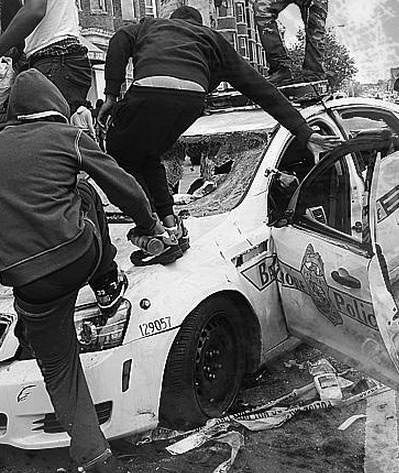 At this point you’d have to be blind not to recognize that Baltimore is broken. They’ve fallen and they can’t seem to get up. And as much as I like avoiding social commentary on The Read, (not fond of the pedantic pundits that pepper our perspectives, and I sure as hell don’t want to be one,) there’s too close a connection with the city not to spend some time on the situation that’s erupted. After all, even though I’ve lived in Shroomville for the past three months, we called Baltimore and the surrounding suburbs home for over 28 years. BK and I started our east coast life in Baltimore, straight out of college from the Midwest, and our two oldest were born in the city. By the time our third came along, we moved out of the city to a suburb where the pastoral country-side offered the promise of playing Manhunt in the summer, sledding the rolling hills in the winter, and idyllic vistas year round. A kid’s haven. Certainly a far cry from Baltimore. We were among the lucky ones who were able to get out. As most hot topics do, the unraveling of Baltimore has become partisan fodder. It’s the American way these days, we continually reveal ourselves as fools who can’t get anything done for the folly of feeding a fight. Predictably, as soon as politicians got involved, it became a game of pointing fingers. Has that really become our go-to? We see a house on fire and stand around talking about who started it instead of working together to put it out? Wow. That’s a miserable commentary on our government and our country. And the media lives to feed the beast. They love nothing more than promoting a good battle. They’ve trained us well, the public seems to thrive on that kind of confrontation; we must, because we allow them to shove enough of it down our throats. Okay, as I’m bad-mouthing the media, I have to come clean. I’m addicted to social media; only two, but I admit, I need my daily fix of Instagram and Twitter. Ahhh, I said come clean, several times a day. Sadly, social media is just as bad. Each platform has had their share of pointed commentary about the riots, through both imagery and 140 extremely opinionated characters. The Twitter comments in particular are one of the reasons I felt compelled to write this blog. It floors me when people make comments about the rioters needing to just get a job and make something of themselves. That’s when I recognize the twit in Twitter. The cycle of poverty is so deeply established in Baltimore, that kind of criticism has no relevance; destitution reaches back so many generations, it’s become systemic. Unless there is some concentrated attention given, the poorest among us will continue to degrade and, as we have seen, they will take everybody down with them as a response to being forgotten. What do they have to lose, nothing. Which is exactly what they have. When we lived in Baltimore City, I used to volunteer at a day shelter called, My Sister’s Place. The shelter offered showers, fresh cloths, food and help finding a place to sleep for the night, among other things. Volunteering there was an interesting education. I remember one day in particular, a woman, (I say a woman but she wasn’t much past a child herself,) came in with four, stair-step children. I could have been wrong but it looked like the kids were from different fathers. When the young woman spoke, you could see that she had a mouth full of badly deteriorated teeth. It was fairly obvious that she had no one who showed her the basics of caring for herself, (or there just wasn’t access to proper facilities on any regular basis.) She paraded the kids in and plopped them down with a plate of the donuts we’d put out. Her goal for being there was a little food, an interim daytime shelter, and securing a place to sleep that night. It didn’t seem to phase her. She was a product of the system and her children were being groomed to operate their lives the same way. They were walking a path that had no exit. My question is, are we so unimaginative that we can’t find creative ways to break that cycle? I can’t believe that. We are a county of tremendous resources, and a people that have shown extraordinary ingenuity building our country. If we put the same amount of effort into solving the problems of poverty as we do into arguing about everything, we would have a thriving populace. So, am I crazy or is it obvious to everyone else that the government can’t deal? Let’s just take it off their hands. Or at least supplement their efforts more effectively. They can take care of education; because, truly, that is the root of ending all poverty. They can also make it easier for non-profits to work as civic emancipators. If the government would invite it, there are some creative minds out there that can make a difference. My daughter, Shay, is a prime example. Her mind thinks in terms of repairing, doing what needs to be done to make things better. She has a list of non-profits she’d like to create and I know she’s not alone in those desires. There are passionate people out there, why doesn’t the government call a summit on innovative ways to address poverty and a lack of education. Shay has a cool one that would partner struggling school systems with established recording artists, to incentivize attendance. Seems like a no-brainer that kids would stay in school if they were working toward a session in a studio with one of their favorite musicians. There are definitely creative solutions that can be employed. The government programs alone aren't getting it done. But first we have to challenge the mind-set that someone else will take care of the problem. I was stopped at a traffic light today and watched a sad and telling scene unfold. An older man had fallen down on the sidewalk. One, lone woman was trying to get him on his feet. Struggling, unsuccessfully. There were about five more people waiting for the light to change at the cross-walk, all standing within six feet of the incident. Not a single one of them tried to help the woman. They all just stared at the light as if willing it to change so they could escape from the uncomfortable predicament. What is wrong with us? Didn’t it dawn on any of them that a second set of hands on the other side of this elderly man would have made all the difference? Nope. Although they turned back several times to watch her struggle, no one lifted a finger. The woman finally got the man to his feet, unsteady and shaken, but he was up by the time the line of traffic started moving. Sad. There are a lot of people who have fallen down and need help getting up. And some of them are rioting on the streets of Baltimore. Hopefully, their predicament will start a dialogue, a conversation that needs to be global. We all need to take care of our own. Especially when the ones who have stumbled don’t have the where-with-all to make it up alone. That thing about being our brother’s keeper, that’s for real. It’s not a cliché witticism, in all earnest, I believe, united we will stand, divided we will fall. When we do, I wonder if there will be anyone there to help us up?